Question Summary: What are the theoretical drivers of pre-flop opening ranges? I see so many charts online and in books, and they all differ slightly. They are very rarely theoretically justified, other than the obvious "as you get closer to the button, you should loosen up since you don't have to fear raises ahead of you and you can be more confident you can steal the blinds". (Another obvious thing people state: the higher your stack, the more you play for implied odds). This is all well and good, but it doesn't tell us why specific hands make opening ranges and others don't. Why play 98s but not 32s? There is no way that 98s is EV+ against another person's range in later position if all that's driving this is fold equity + occasionally winning with middle pairs. So it must be that we play this hand due to its implied odds of catching straights and flushes. But if 98s is opened, why not 32s? Why not play KQo? Why is KQo (and other high broadways) not played? Is it because it can't withstand 3-bets? If you're at a table where no one 3-bets, can you play this hand (since they after all will be ahead of the range of those who call after you closer to the button)? In general, what theoretically is causing these specific hands to be thrown away and other specific hands to be played? Are we trying to achieve a certain frequency and doesn't matter what we pick (at the margins)? What is driving all of this this (other than the obvious and entirely unhelpful "we are trying to maximize EV")? Disclaimer: I'm not good at poker. There's more to consider than raw equity when deciding which range to assign each hand to. This is because there are more rounds of betting, where certain types of hands will tend to surrender their equity more often than others by folding. 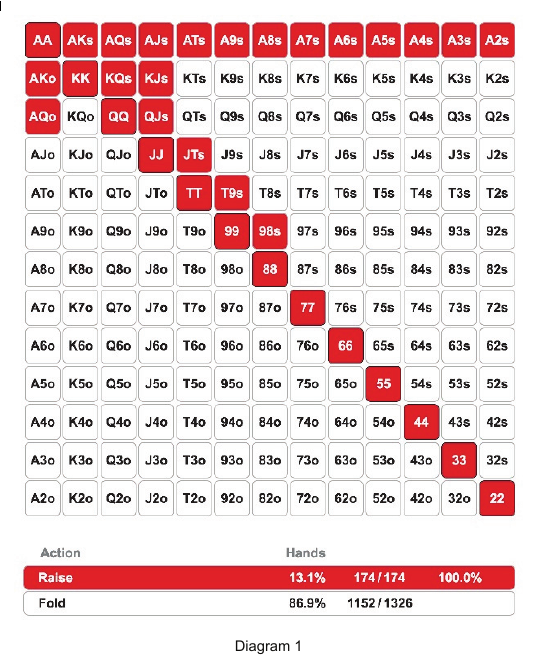 Suited connectors, such as 98s, hit the most flops out of any type of hand, because they can flop straight draws and flush draws in addition to pairs. While they don't flop strong hands like top pair top kicker, they do flop outs. Even bottom pair is five outs against a bigger pair. These outs let you bluff more often, because you still have outs to win if they don't fold. These folds are where suited connectors make up for their lack of preflop equity. For example, a player holding 33 would not feel comfortable calling two streets on a board of 7-5-4-Q with two hearts and two spades, which it must do to realize all of its equity against 98s. While this is good, suited connectors don't actually often end up with strong hands on the river. Straights and flushes are not easy to make in this game. In a live low-stakes environment where you see a lot of showdowns, bluffing when your suited connectors catch a piece of the flop shouldn't be a large part of your strategy. You limit the number of bluffs you make is by playing fewer starting hands that tend to turn into bluffs. If you only play some of your suited connectors, it makes sense to only play the best, as in highest, ones. This author has chosen, rather arbitrarily, to limit his selection to 98s or better. He could have chosen a lower bound of 87s or 76s, and the reasoning would remain the same. Hands like KQo and AJo are not included in this range simply because they are not suited. The only two unsuited unpaired hands in the entire chart are AK and AQ. Generally, in live low-stakes poker where pots are large and action is often multiway, suitedness becomes important, because flushes are big hands capable of winning big pots. Hands like KQo make top pair with a good kicker often, but top pair with a good kicker does not get many streets of value out of position against four opponents. The value of hands whose primary strength is making good pairs, therefore, decreases in the kind of game the author is writing advice for. Finally, this does not look like a range based on modern solver work, and modern theory probably recommends against opening 22 under the gun. Rather, it is part of an exploitative strategy that targets a specific kind of game and player. This means there isn't much reason for why the range ends exactly where it does. You will not be committing a serious error adjusting the edges of this range to better suit your playing style, or to better suit the kinds of games you play in. If you just look at 5 card straight 98 has 4 ways to make a straight and 23 just 2. Two pair with 23 has twice the chance of getting counterfeited with the board pairing when opponent has an over pair. Too much chance of being dominated and loosing a big pot to AK or AQ. This is an interesting question. I don't have the exact mathematical answer as to why a 13.1% opening range early position is sound, but i will try to answer the two follow up questions you posted. Note: I find the opening range in the book too wide early position, as its hard to defend that range against a table that knows how to 3-bet. Why play 98s but not 32s? Suited connectors in general are bluffing hands that flop good equity. Because of that, its better to play them in late position for higher % steal success. Nonetheless it's ok to mix up some opening ranges early position so that you don't only have value hands early position. That said, you should be playing bluffing hands as a % of how many value hands you are opening. If you are opening all suited connectors early, it is way too wide and difficult to defend against aggressive 3-bets. On this note, 98s > 32s because its less likely to be coolered or counterfeited, so it has more equity and are better hands to bluff. Why not play KQo? (Personally i do play KQo early). KQo is harder to play because its harder to know where you stand if you hit the flop marginally (i.e. QXX or KXX). You tend to be behind if the pot is big, and its hard to play when facing aggression, especially over 3 streets. Suited cards always give more equity. the value of playing suited connectors in general is usually found when they make hands that are 2-pair or better (especially flushes and straights). The hands are sometimes overlooked by weaker opponents and can make a lot of money from implied odds, like the book suggests. 23s is much weaker than 98s because when it does make a hand (ex. 2-pair, straight, or flush), they are very weak. If 23s makes a flush and the opponent is holding 2 cards of the same suit, 32s is drawing dead. 2-pair hands are easily counterfeited if the board pairs, and even if 23s makes a straight it will either be the wheel or straight to 6. the straight to 6 is beat by 78s, and it is much less likely to make a straight with this hand, since there is only 2 straights you can make. This hand is much more borderline, you could definitely justify playing it in this situation, however if you do choose to play it you should tread carefully. The hand is very unlikely to make a flush and it is very possible that better Kings or better Queens call or 3-bet since you are opening it in early position. Early position opening ranges tend to be tighter, keep this in mind. Why is this a poor play? Do odds depend the the number of hands folded preflop? What to gain from opponent hand? Why call with the top X% of your range when being laid X% pot odds (by an opponent playing GTO)?